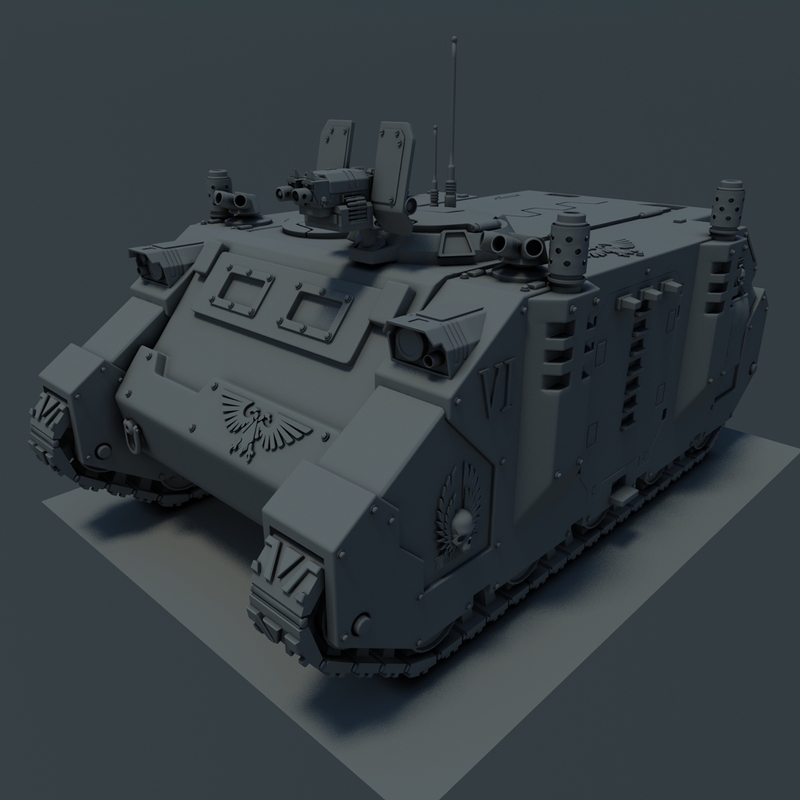 hello everyone, wanted to show you my WH40k Space marine Rhino that I have been working on. Currently the untextured version. any thoughts, either negative or positive would be awesome. 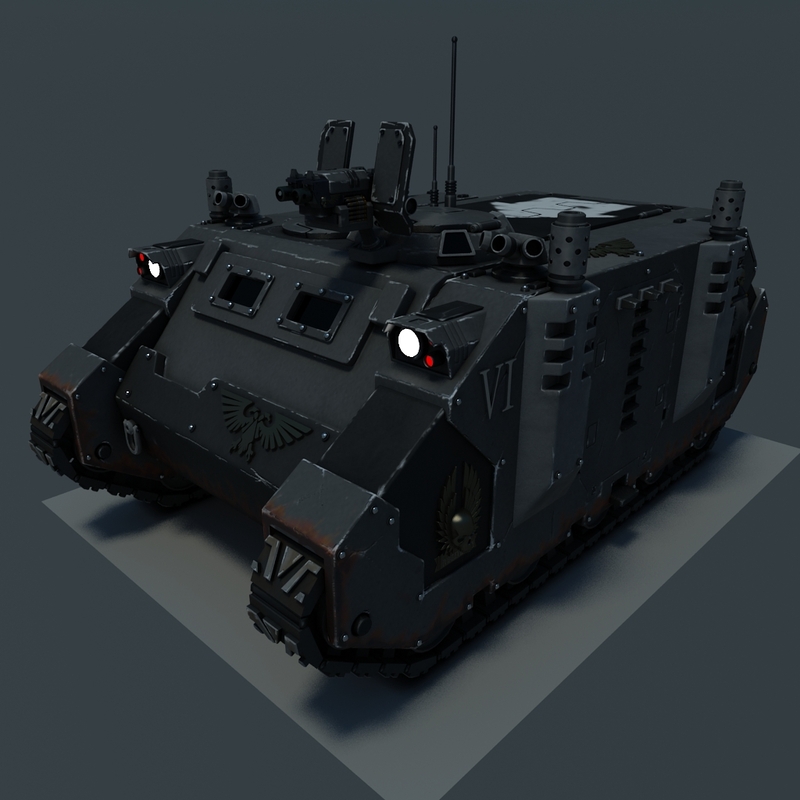 Top notch Rhino, lets hope the Fabricator General approves of the 'alterations' from the STC rhino. I like them, feels it makes it a little more advanced. was working on Texturing earlier, im not going to go with a specific chapter currently, mostly just trying to get these finalized. 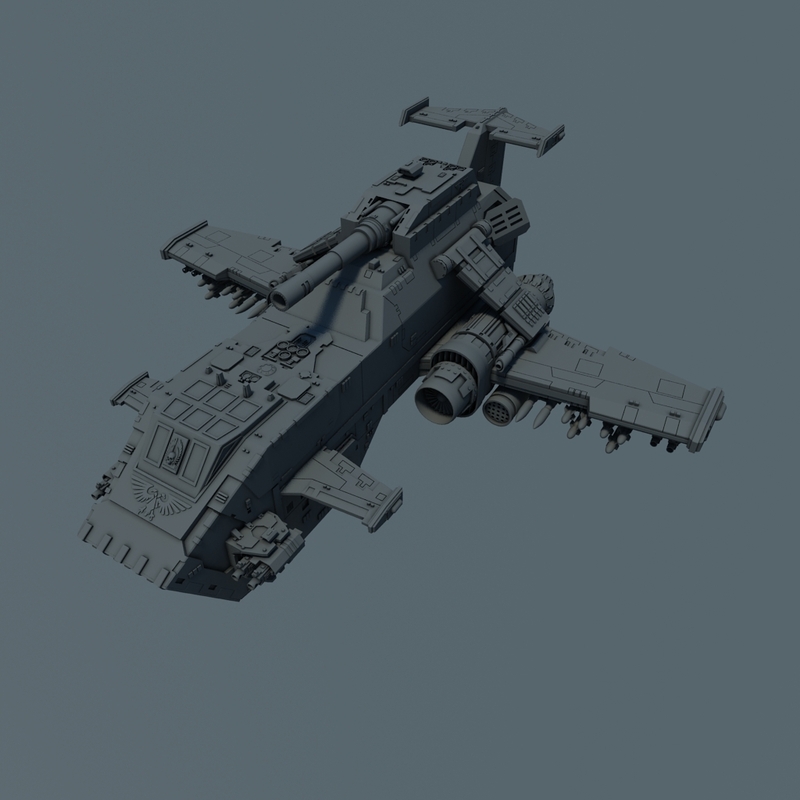 (i have Space marines, Terminators, Dreadnaughts, DropPods, DropShips, Predators, Scouts, Speeders, and currently modeling the environment) i'll post some of my work here soon. i was really inspired by Jas, Andrea1969, and Estraga's work so i tried it out for myself. I'll post more pics later on. Right back to your mesh, nice texturing, just a couple of little points. Have you been using the painted models for ref? Just it looks very similar, which is understandable, I use a lot for ref too, but don't you feel the wear is a little even? Its mainly around the edges, quite evenly spread, with very little damage to the larger parts. Plus it doesn't account for areas which would naturally get more damage due to the position eg along the bottom edges, the front and the tracks. Don't get me wrong I like your model, I'm just been picky. Keep up the good work, hopefully I might have some updates for my wip soon. The model looks pretty good to me. Can we see some wires? The textures in the second pic aren't doing much for me, but Marine paint schemes are all fairly dull as a general rule. The IG certainly have one over them in that regard. Impact dents on the hull would be easy. The gunshield with that gaping space seems odd. Would make the gunner a prime target. I lovedddddd the track work! 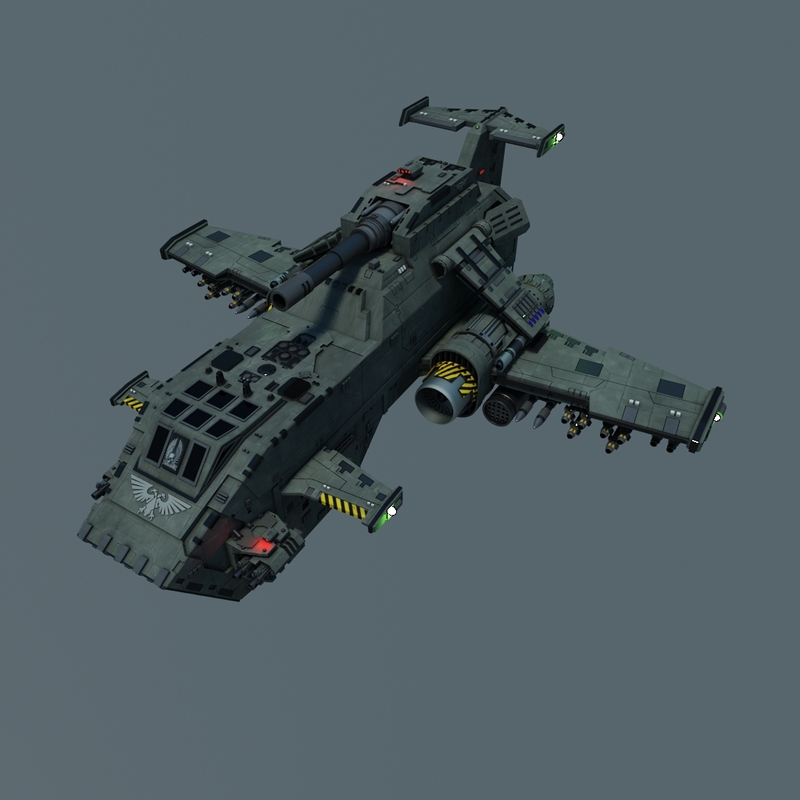 Maybe place spare treads pieces on the hull for field repairs, would give a utilitarian aura. This was just the first pass, am going to add more scratch/dent to the front and the bottom as well as burn marks and possibly bullet holes. DCB-im sorta torn as far as the coloring/specularity of the vehicles. having served in the US infantry i know that all of our textures on vehicles (paint) were a very dull coloring (basically a matte camo pattern) and even the Bradleys had a matte coating to reduce the metal shine. However i agree that IG have a much broader range of colors, patterns and emblems to choose from. Thx again guys for your feedback. Still missing Bump/Spec and Scratch/Dent Maps, let me know what you guys think.